The "Millionaire" is generally acknowledged as the first commercially-successful calculating machine which could perform multiplication directly rather than by repeated addition. These pages give an illustrated technical description of its internal mechanism and its principles of operation. The Millionaire mechanism was developed during the early 1890s by Otto Steiger, a Swiss citizen living in Munich. His German Patent 72870 of 1892 describes a machine which uses a mechanical representation of the multiplication table to form partial products, in the same way that a human "calculator" uses a multiplication table committed to memory. The partial products are then transferred via a "transmitting mechanism" to a "combining and registering mechanism" for display to the operator. Steiger's design was taken up by engineer Hans W Egli of Zurich, who made numerous changes and improvements as he developed the machine for production. The first "Millionaire" was sold in 1893, with more than 4000 units following over the next 30 years. The Millionaire was distributed in Australia by the firm of Peacock Brothers, although imports were disrupted by the 1914-18 war. The machines were widely used in applications requiring frequent multiplication and division, especially in the insurance industry, the mining industry, and the railways. 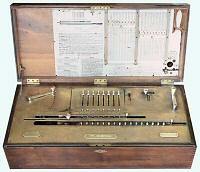 The Millionaire could not be surpassed for rapid and reliable multiplication until the fully-automatic rotary calculators became available in the mid to late 1930s. Unfortunately, the supply of these new machines in Australia was limited by import restrictions during the 1939-45 war, with the result that many Millionaires in this country continued in active service well into the 1950s. 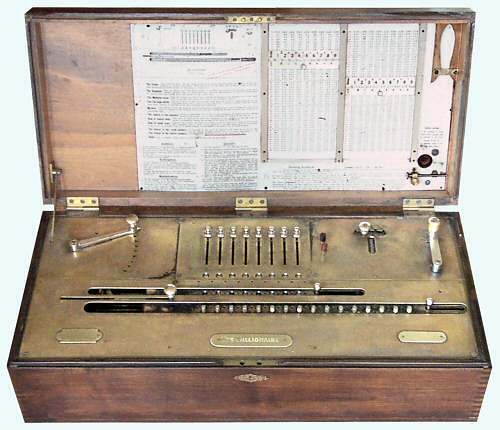 The Egli firm went on to develop an automatic division machine (the MADAS) in 1913, and a full-keyboard rotary calculator (the Portable MADAS) in 1931. Design details from Steiger's original patents can still be seen in the MADAS calculators of the 1960s. The notes and most of the photographs in these pages were prepared during the overhaul of Millionaire number 2968 during 2006. The descriptions are based primarily on my own observations and interpretations, supplemented by reference to original Egli publications and the US patent documents. Machine number 2968 is a key-set machine which was originally fitted with an electric motor drive. The motor and most of its control mechanism have been removed at some stage in the machine's hundred-year history. Differences between this machine and the more usual slide-set machine (as illustrated above) are noted where appropriate. These notes are intended as a general guide to the construction and the principles of operation of the Millionaire mechanism. While I believe my descriptions to be substantially correct, I do not guarantee that they are accurate, complete, or applicable to any other machine. Please do not dismantle a Millionaire in the expectation that these notes alone will get it back together! I would welcome advice of any corrections, or suggestions for improvement. US Patent 538710 contains a full description of Steiger's first design for a multiplying machine. The mechanism was patented in Germany in 1892, and in France and Switzerland in 1893. The US patent was filed in 1893, and issued on May 7th 1895. US Patent 558913 describes Steiger's second design, which was adapted for production by Hans W. Egli. The patent was filed on September 17th 1895, and issued on April 21st 1896. The filing date (rather than the patent date) appears on the top plate of the machine, and on most of the original publications. The Technical Section on this site has a description of the MADAS full-keyboard rotary calculator, manufactured by the Egli company in the 1950s. The "family resemblance" to the Millionaire can be clearly seen. Original text and images Copyright © John Wolff 2006-07.